Benson was a Netherlandish painter active in the 16th century who specialised in portraits and religious compositions. His paintings recall the style of Jan van Eyck and Rogier van der Weyden, as well as that of Gerard David in whose studio he worked. Most of Benson’s works are in Spain as a result of the thriving commercial links between the Iberian Peninsula and the Low Countries at that date. This panel depicts a man in prayer and may therefore have been the lateral wing of a diptych or triptych with a religious scene in the centre and a female figure on the other side. It is a notably realistic portrait, with all the sitter’s features highly individualised. In the middle-ground the artist has included a landscape painted in dark tones that he uses to emphasise the volumes. Colin Eisler has related this work to a female portrait now in the Toledo Museum of Art in Ohio. 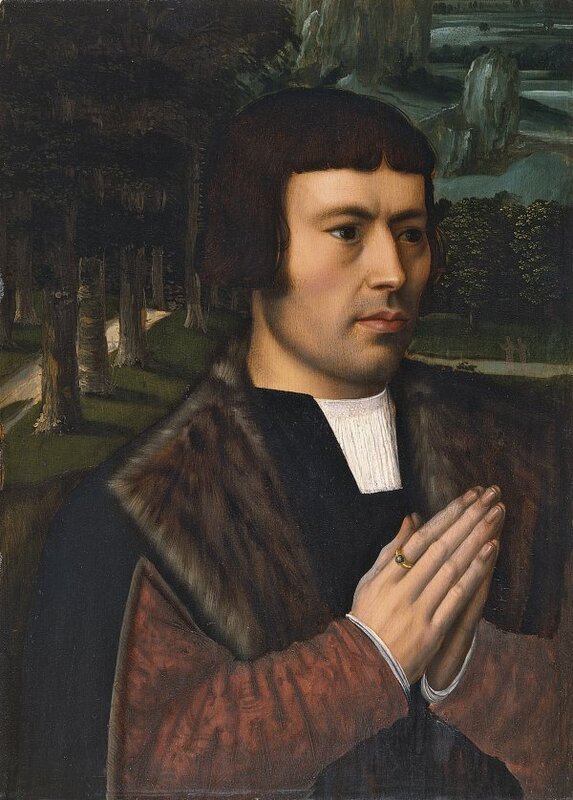 The first reference to this painter of Lombard origin dates from 1518 when he became a citizen of Bruges, an obligatory requirement in order to practice as a painter. The following year Ambrosius Benson is registered as an independent master in the painters’ guild in that city, which was an important commercial centre. At the start of his time in Bruges he also worked briefly as an assistant to Gerard David, whose style and models influenced his own. Nothing is known about Benson prior to his arrival in Bruges. Once there he achieved a comfortable financial situation and occupied positions of responsibility in the artists’ guild of which he was vinder, dean and treasurer. He also established profitable contacts in the cosmopolitan city of Bruges, particularly among the Spanish community, for which reason Spain now has one of the largest and best groups of works by the artist. Benson seems to have worked with intermediaries when exporting his paintings. While the archives of the city contain numerous references to his activities, there is less information on his works. Among the paintings now attributed to him are religious compositions, portraits and a group of figures playing musical instruments. In his religious paintings Benson used traditional formulas derived from Flemish painting that recall the work of Gerard David, his first master, as well as Jan van Eyck, Rogier van der Weyden and Hugo van der Goes. His portraits are particularly highly regarded although small in number. This fragment of a panel, which is cut down at the lower edge, depicts a donor and was probably the left wing of a diptych or triptych. In either case the right wing would have been occupied by a female figure, conforming to pictorial tradition. The panel entered the Thyssen-Bornemisza collection 1934 from a private collection in Riga and was published by Friedländer that year. The panel depicts a young man who was presumably kneeling and adoring the central image in the altarpiece, which may have been a Virgin and Child group. He is finely dressed in a cape with a wide fur collar, open to reveal his red sleeves whose colour and pattern contrast with the dark cloak. The face is well defined with the features correctly drawn, framed by the short, straight and rather rigid hair and the crisp white line of the under-shirt. His hands are long, with slender, well-defined fingers and nails. The background conforms to the traditional type with a landscape painted in dense, dark tones. On the left we see a brightly lit path flanked by large tree trunks that leads the eye into the background in which some jagged rocks are visible. Colin Eisler related this portrait to another in the Toledo Museum of Art, Ohio, of a woman, also in prayer in front of a cultivated landscape.